Browse: Home / 2012 / March / Air India’s 787 takes flight. Sortof. Air India’s 787 takes flight. Sortof. One of the bigger headlines out of New Delhi today is that an Air India 787 Dreamliner made the trip over from Seattle yesterday. The plane is in India for the India Aviation 2012 conference which starts in Hyderabad later in the week. And with all the bad news lately out of India’s aviation sector seeing the local colors on the newest jetliner should be a welcome sign. And it probably would be, except that the plane really isn’t Air India’s. 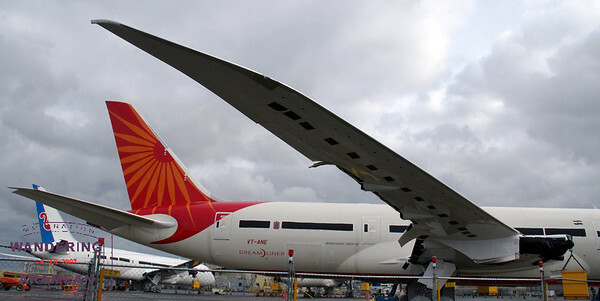 An Air India 787 awaiting delivery from Boeing. The aircraft still belongs to Boeing and no deliveries for Air India have been formally scheduled yet, so this isn’t "real" in that context. Plus there is still some question as to whether the carrier will manage to take delivery of the aircraft, though the recent financing deal with the Export-Import bank in the USA seems to have quelled most of those. Then again, the lobbying arm of the USA-based carriers is still opposing the financing deal, so who knows what will happen there. Great to see those colors flying on the bird…hopefully they continue to do so.